Go to the Income tax website and get the User ID and Password. The Already registered persons may Log in. Those who did not register already must register by click the Register Yourself Link. Click the Individual link on the next page. Before filling the informations on the next page, You must go to the income tax link and get the important informations about the tax. PAN number, Surname, D.O.B should be filled in the Roll No.5 related questions. In the same way you will fill the step 1, step 2, after that you got a link by yours mail address. By click the new link your account will be activated successfully. After the activation of your account you Log in by using yours User ID and Password. If you Log in you see the quick e-file ITR and click it. You filled the page like the below method. The PAN number is already filled. After summit the you got the next page. In this page you see 6 windows and SUBMIT, Save DrafF, Exit Buttons. The First me is self-details page. The first part is already filled. You have to filled the coloumn 7. The second part have to be filled like the below method. 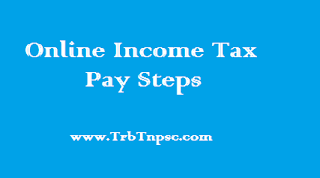 You have to filled the Income details by using the form 16. Before registering you can tick the red box, If you worked in two varies places and you already paid in those two places and you already pain these two places you can click the add button. In the Tax details page you have to filled the paid details. In the taxes paid and verification page we have to filled only the bank account details. The other informations are already filled. If you donate amount to any welfare organisations, you filled it on 80 G page. After filled all the details you can click the submit Button. If your details are fully filled accurately, the ITR V form can be appeared. We can download it. E-Verify facility will be launched this year onwards. e-Verified persons does not send their ITR-V forms to the Income tax department. The last date for submitting your income tax is 31.08.2015.